Summer is a tough time for lawns, and this summer was especially tough on some. 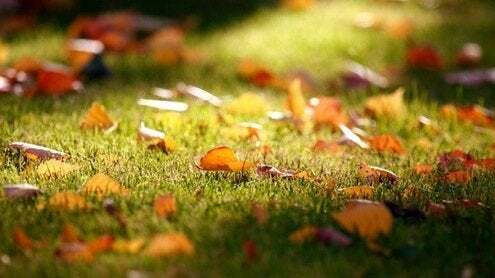 But every year we get a do-over in the fall: this is the time to treat your lawn right and boost its ability to handle whatever next summer dishes out. When it starts cooling off, it’s a good time to scratch up the bare patches and put down some new seed to fill them in for next year. A fall fertilizer over the whole lawn will nourish the roots without encouraging a lot of growth above ground, so the plants are ready to leap in spring. Use a natural fertilizer or compost tea that will work with the organisms in the soil to strengthen the roots, aerate the soil, and build your lawn’s resistance to drought. When you water, be sure you soak the ground several inches down to encourage roots to go deep and fend for themselves. And when you mow, don’t mow too short; longer grass can absorb more nutrients from the sun and shade out weeds. The deeper the roots and the longer the blades, the less babysitting your lawn will need from you next year!